There are different ways you could get involved in this. You could come and spend time with the cats at the centre encouraging them to socialise, coaxing and grooming the timid ones and helping them all become used to being handled. 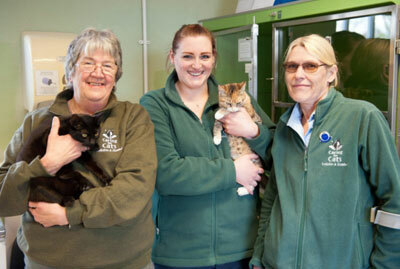 Maybe you would like to give hands-on care for the cats at the Homing Centre (photo right: volunteers Ros, Sophie & Rose) or foster unit in South Cave? Cleaning and feeding is done twice a day, before and after opening times, and volunteers put their names down on a monthly rota. Find out more here. 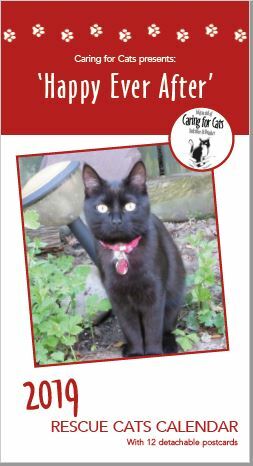 Fostering is an option if you have a lot of time to spare, caring for the newly rescued cats until they are ready to move into the centre for rehoming. This involves feeding and cleaning, administering medicine, grooming, socialising and all the other things the cats might need. Short and long-term fosterers are always needed. Short-term periods required vary from 2-6 months – please call the charity coordinator on 07967 627492 if you think you can offer this time commitment to an animal in need. If you can drive and own your own car then maybe you would you like to volunteer to transport the cats between the vets, the foster homes, and the Homing Centre. Sometimes transport is needed urgently and a cat’s life can depend upon it! Volunteer drivers should call the charity coordinator on 07967 627492 if they can regularly offer support. Can you help us running a tombola stall at local pet stores (photo right: volunteer Angela at Pets at Home, Hull), fairs and events during summer and at Christmas time? We have Christmas cards, calendars, diaries, cards etc and hold raffles at Christmas. Could you sell any of our goods for us? 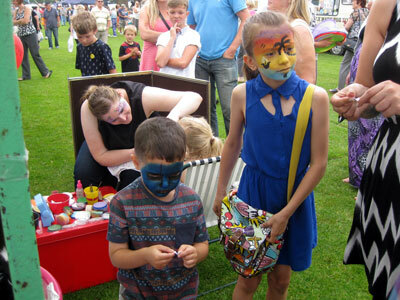 Or do you have a skill to donate, such as face painting? Would you hold a coffee morning or other fundraising event? Do your friends tell you they have received unwanted gifts at Christmas and birthdays? Even small ones make great tombola prizes! Perhaps you know somebody who could offer us a major raffle prize such as a meal for two in a restaurant, tickets to a venue, a hamper or some other prize? Donations can be left at our homing centre during opening hours. Our charity shop at 7 Dyer Lane in Beverley is open Monday to Saturday and always welcomes donations of nearly new items as well as new volunteers. 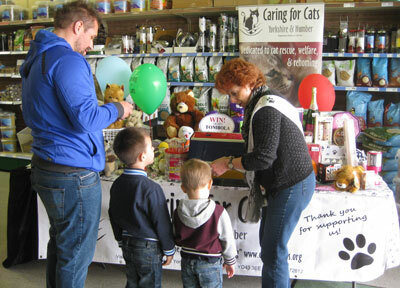 Volunteers look after the till, help customers, sort through donations, price up stock, merchandise and more. We can also offer volunteers who wish to come for 16 hours or more the opportunity to carry out an NVQ level 2 in Retail. Whether you work in IT or as a plumber or photographer, or face paint or make jewellery as a hobby, let us know if you are willing to donate your time, skills and knowledge to help us run the charity or fundraise. Every volunteer can make a difference. Approach a supermarket near your home or join us when we have a day collecting food and donations at supermarkets. Perhaps you know of some other source of cat food? Please let us know. In the comfort of your own home, could you knit, sew or make goods that we can sell to raise funds? The charity is well-known for its hand-knitted strong catnip mice made with cat-safe materials and lots of love! More patterns to follow… see pics bottom of page. Could you grow/donate ingredients/bake/sew or collect materials for others to use? If you are able to make preserves for us, please ensure that lids are vacuum-sealed. Or please take your spare clean 1lb jam jars with lids to the Homing Centre. To volunteer with us, please call 01430 872612 and leave a message, or stop by our Homing Centre in Market Weighton to chat to someone. Thanks!